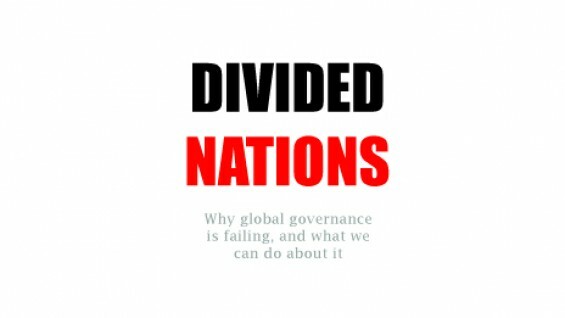 The former Vice President of the World Bank discusses the problems and the various approaches to global governance, highlights the challenges that we are to overcome, and considers a roadmap for the future in a lecture based on his new book, Divided Nations. Rapid global integration and urbanization together with game-changing leaps that have globalized technology, communications, mobility, and business, all bring profound advantages, but they also bring systemic risks that are only just being identified and understood. Many of the biggest challenges today's world faces spill over national boundaries: climate change, finance, pandemics, cyber security, and migration. And the hard truth is that our global governing bodies-- created in the 1940s--are simply not up to the task of managing such risks. As a former Vice President of the World Bank, and head of the multi-disciplinary Oxford Martin School of Oxford University, Ian Goldin is in a superb position to provide new perspectives and approaches to our world order. He explores whether the answer is to reform the existing structures or to consider a new and radical way of tackling inherent failings. Professor Ian Goldin is Director of the Oxford Martin School and Professor of Globalisation and Development at Oxford University. Ian was previously a Vice President and Director of Development Policy after serving as economic advisor to President Mandela and Chief Executive of the Development Bank of Southern Africa. He has an MSc from London School of Economics and an MA and DPhil from Oxford. He has published 17 books, including Divided Nations (Oxford), Globalisation for Development (Oxford), Exceptional People on Migration (Princeton), and The Economics of Sustainable Development (Cambridge).